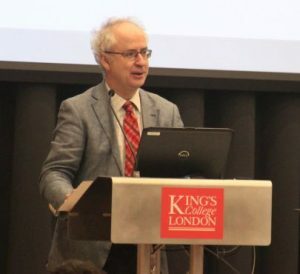 Sir Simon Wessely is professor of psychological medicine and Regius professor of psychiatry at King’s College London and a consultant liaison psychiatrist at King’s College and the Maudsley Hospitals. He is also past president of the Royal College of Psychiatrists. His doctorate is in epidemiology, and he has over 700 original publications, with an emphasis on the boundaries of medicine and psychiatry, unexplained symptoms and syndromes, population reactions to adversity, military health, epidemiology and others. He has co-authored books on chronic fatigue syndrome, randomised controlled trials and a history of military psychiatry. Professor Wessely is also president of the Royal Society of Medicine.